This article is about the settlement in West Sussex, England. For other uses, see Wittering. West Wittering is a village and civil parish situated on the Manhood Peninsula in the Chichester district of West Sussex, England. It lies near the mouth of Chichester Harbour on the B2179 road 6.5 miles (10.5 km) south-west of Chichester close to the border with Hampshire. The sandy beach has been described as having excellent water quality. The population in 1872 was 616. The 2001 census records a population of 2,684. There is a primary school. An electoral ward in the same name exists. This ward includes some of Birdham and at the 2011 Census had a total population of 4,472. Part of the Site of Special Scientific Interest Bracklesham Bay runs in between the coastline in the parish. Chichester Harbour, a Site of Special Scientific Interest is partly within the parish. This is a wetland of international importance, a Special Protection Area for wild birds and a Special Area of Conservation. The harbour is of particular importance for wintering wildfowl and waders of which five species reach numbers which are internationally important. Sarah Ayton, Olympic gold medalist. Michael Ball, actor and singer. Sir Henry Royce, engineer, designer of Rolls-Royce cars and aero-engines. From 1917 until his death in 1933. The locality is referred to in Giles Cooper's Unman, Wittering and Zigo. At the mouth of Chichester Harbour lies the little settlement of West Wittering, beautiful and glittering when the sea flows round it at high tide, forlorn and untidy when it is out. 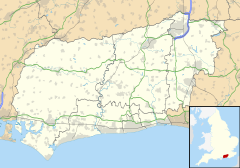 ^ a b "2001 Census: West Sussex – Population by Parish" (PDF). West Sussex County Council. Archived from the original (PDF) on 8 June 2011. Retrieved 5 June 2009. ^ "Blue Flag Beaches". FEE International. Retrieved 22 October 2017. ^ "Ward population 2011". Retrieved 17 October 2015. ^ "SSSI Citation — Bracklesham Bay" (PDF). Natural England. Retrieved 4 April 2009. ^ "SSSI Citation — Chichester Harbour" (PDF). Natural England. Retrieved 7 April 2009. ^ "Sunday Times December 23, 2007". ^ "Sunday Mirror May 23, 1999". Wikivoyage has a travel guide for Bracklesham Bay.